Bread is my main food weakness, especially the seeded types. 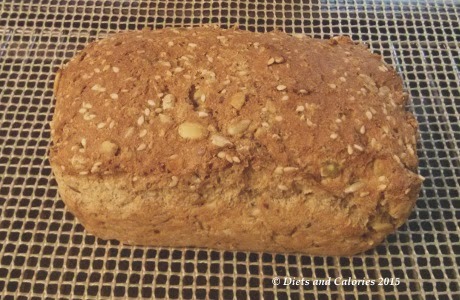 The trouble is, all those seeds make for a very calorific bread. A single slice from some brands can contain up to 150 calories, or more. So I was amazed to find this bread by Sukrin which is not only packed full of seeds, it doesn’t even contain any wheat. And, according to the nutritional label, one slice provides just 47 calories. The trouble is, it’s not cooked. You have to bake it yourself. Was it worth the bother? As a complete non-baker, whose attempts at cake making routinely fall flat, the last thing I wanted to do was make a loaf of bread. But quite honestly, this bread mix from Sukrin must be the easiest bread in the world to make. 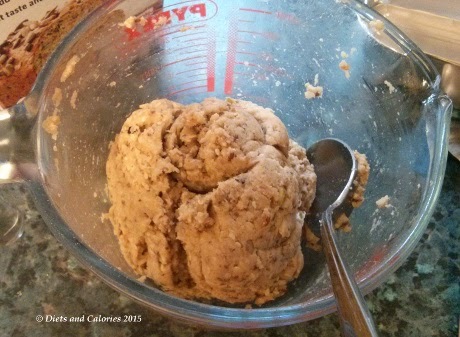 Put bread mix into a bowl, add cold water, mix and leave for three minutes. 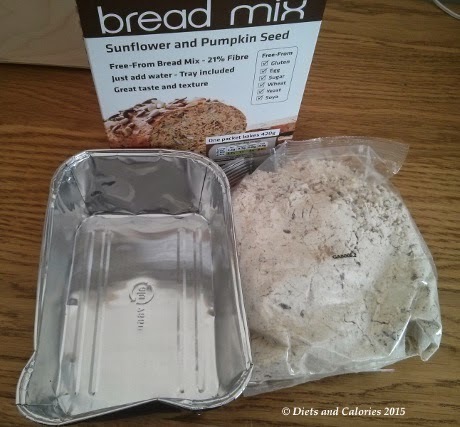 Put bread into the foil tray (enclosed inside the box). Put bread into oven and leave it there for 1 hour and 20 minutes. Due to the temperamental nature of my oven, I had to turn down the heat towards the end of cooking otherwise I’d have ended up with a burnt top. But apart from that, all went according to plan. Once it’s cooked, you have to leave it to go cold before slicing. However, I couldn't resist breaking off a small piece while still warm and spreading with a teeny bit of butter. So what’s it like? 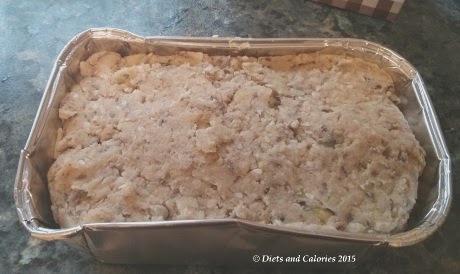 Well, it smelt delicious, and having the aroma of freshly baked bread in the house made a pleasant change from the popcorn my daughter keeps making. And the taste? With just butter the taste is a little bland. I put a tiny bit of honey on top for a bit more flavour. This perked up the overall taste experience. What I enjoyed best was the gorgeous crunchiness. Every bite is full of crunchy sunflower and pumpkin seeds. Once the loaf was totally cold, I carefully cut it into 14 slices. This way each slice should have around 47 calories (as per the label). I must admit, these 14 slices were on the ‘slim’ side! The loaf itself doesn’t rise massively, but nicely fills the container it comes with. While I did slice this bread thinly to keep the calories down, I also had another motive for doing this. The price! 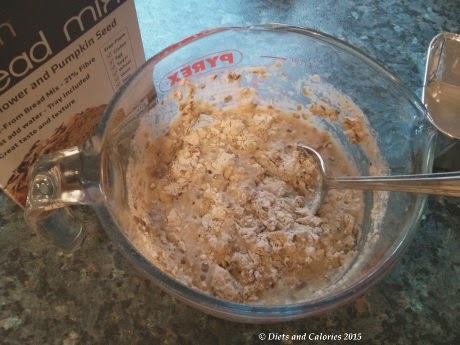 One box of Sukrin bread mix costs £4.99, so I intend to make it last as long as possible. Once my family had all sampled some, I put the rest into the freezer. This way it will last longer and I can easily take out one or two slices to toast. The information on the packet advises that it will keep in the fridge in a bag for up to 5 days. ‘Bread lovers can now include those on special diets and those who simply want to follow a healthier lifestyle. Whether you’re a professional sportsman, looking for a healthier lifestyle, or following a specialist diet Sukrin Bread Mix makes a perfect daily addition to your diet. 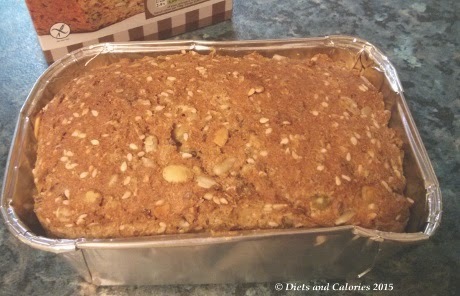 The box contains 210g of mix which when baked, results in a 420g loaf. This is a healthy bread which nutritionists are all too happy to recommend. It's great for those on a gluten-free or wheat-free diet, or anyone who is looking to cut down on their wheat intake. Available in branches of Holland & Barrett, Ocado online, Amazon and various health stores. It's a bit cheaper on Amazon, and cheaper still if you buy the bigger 1 kilo bag. 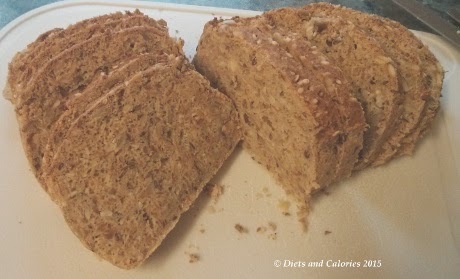 Nutrition Information per 30g slice: 47 calories, 2.2g fat, 0.2g saturated fat, 1.1g carbohydrates, 0g sugars, 6.4g fibre, 2.6g protein, 0.4g salt. Nutrition Information per 100g: 157 calories, 7.5g fat, 0.8g saturated fat, 3.6g carbohydrates, 0g sugars, 21.3g fibre, 8.7g protein, 1.3g salt. 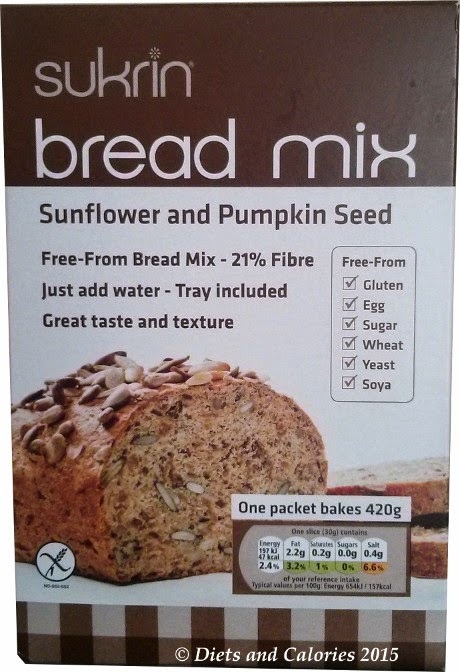 Ingredients: Seeds and kernels (Psyllium, sunflower, sesame, pumpkin, flax), fibre (from sugar beet, chicory and peas), Sukrin Fibrefine (resistant corn starch), flax seed meal, whey protein, pea protein, sweetener Sukrin Granulated (all natural sweetener erythritol, made from corn starch), mineral salt (sodium chloride and potassium chloride) , raising agents (bicarbonate, disodium, phosphate). All our products are made with Non-GMO Ingredients. Contains no artificial colours, additives or preservatives. Suitable for: Vegetarians, Halal, Kosher. Not Suitable for Vegans. Contains dairy and sesame seeds. For more information, visit the Sukrin website.